In the Square and Round Dance Activity we occasionally have the opportunity to share the accomplishments of individuals, whose dedication and commitment to community, church and the Square and Round Dance movement, is extensive. The Round Dance movement has been fortunate to have had the talents of Tom and Joyce Riding. Music and Dancing have always been a part of this couples sharing, whether it be Ballroom Dancing or Square and Round Dancing. Tom and Joyce were committed to the youth and young adults in the community, founding clubs and assisting established organizations. Tom is still actively involved in Church Stewardship. 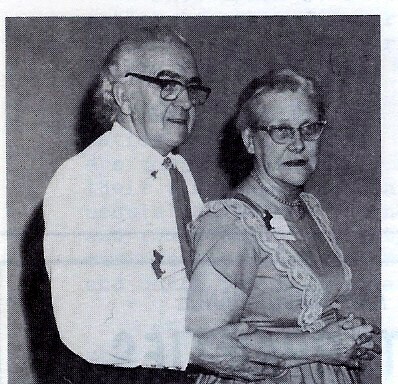 Tom and Joyce started Square Dancing over Fifty years ago in Sanford Maine, and Tom cued and taught Rounds from 1969 until his retirement in 1991. They served as Delegates to the Cooperation Committee and Chaired the Yankee Clipper Award Committee for several years. Tom is currently the Treasurer of the Cooperation committee. Tom is also a member of the Square Dance Foundation of New England and a member of the International organization ROUNDALAB. The Square and Round Dance Community is proud to present Tom and Joyce Riding with the Yankee Clipper Award.